Never really understood coupons, always seems that they are for something I do not use. Switching to another brand just because I can save 20 cents made no sense, will I like it, and back in the day will the kid eat it. Don’t get me wrong I am not against using them for something we already use that would be foolish. Then there are the coupons that print out when you are checking out, you know the ones they are counting on you to forget about or leave at home. Save $7.00 on your next order of $70 or more. Can’t tell you how many times we have forgotten about them until we see them on the counter at home, after shopping. Why can’t they just add it to your non privacy store card and automatically deduct it, makes more sense to me. Better yet why not get rid of those cards all together and give us lower more reasonable prices. So back to my point, we had one of these coupons and remembered it but had to go around finding things that we use to get the total up to take advantage of the coupon. We did it but one of the things was a buy one and get one free package of center cut boneless pork chops. I am still on the fend for myself diet so I figure I could put them to good use. I decided with the suggestion from my wife that I could slip each chop and make cutlets. I know that the loin in the better cut for this but one makes do with what they have. So split and pound I did. I made the following first and then some pan fried cutlets for salads and other meals. ½ small pineapple or 1- 15oz can unsweetened pineapple. ½ cup pineapple juice (either juice from other half or can). 1 Tbsp. light soy sauce. Skin the pineapple, clear all the eyes, and cut lengthways into triangles wedges. Trim away the core then cut across into slices. Toss Pork in a mixture of cornflour, salt and pepper until well coated. Heat peanut oil in wok or fry pan, add pork and fry just until the color changes. Add pineapple, bell pepper and red pepper flakes reduce heat cover and simmer about 3 minutes. Give the sauce a quick stir and add to pork and stir until thicken, toss in spring onions and mix thoroughly. Spoon into serving dish. Sauce: Add pineapple juice gradually to cornflour, mixing until smooth. Stir in soy sauce. I prefer fresh pineapple rather than canned. This can also be made with Chicken instead of pork, works well some might say better. Pineapples contain bromelain, an enzyme that may help arthritis pain by reducing inflammation. They are also a good source of vitamin C, which helps strengthen your immune system. 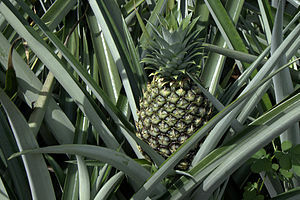 Some of the largest pineapple crops are in Hawaii, which produces 500,000 tons of the fruit each year. This entry was posted in Information, Meat, Pork, Sauces and Gravy and tagged Bell pepper, Pineapple, Soy sauce, Tablespoon. Bookmark the permalink.